BOSTON - Receiving three goals from its top line and a 37-save effort from freshman goaltender Cayden Primeau, the No. 11/9 Northeastern men's hockey team skated past No. 16 Boston College, 3-0, during Monday's semifinal round of the 66th Beanpot tournament, advancing to the championship game for the first time since 2015. Dylan Sikura, Nolan Stevens, and Adam Gaudette provided the goals that put Northeastern (16-7-5) back in the title game. Gaudette assisted on each of his teammates' two goals to lead the Huskies with three points, while Stevens, Sikura, and defenseman Jeremy Davies followed with a trio of two-point performances. Sikura lit the game's first lamp just before the midway point of the first period, capitalizing on Northeastern's second power play opportunity. Skating around the far crease of the right circle, Sikura fired a shot that deflected off the stick of the Eagles' Casey Fitzgerald on its way past goaltender Joe Woll. Davies and Gaudette were credited with the assists on Sikura's 50th career goal. The Huskies took a 10-8 shot advantage into the second period, where Primeau weathered 14 shots from Boston College (13-12-3) while keeping the Eagles off the scoreboard. Northeastern killed each of its two penalties and managed to pounce on BC late, doubling its lead to 2-0 upon Stevens cleaning up Sikura's attempt from the blue line with 4:26 remaining in the second. Entering the third period with a two-goal advantage, Northeastern relied on its penalty-kill unit twice more, successfully fending off Gaudette's trip with 14:02 left in regulation and Sikura's check from behind with 8:49 to go. With the same score and five minutes remaining, Gaudette pushed the Huskies' lead out of reach, finishing the ricochet off Steven's shot from the left dot to give Northeastern a three-goal cushion. Monday's shutout marked the Huskies' sixth during Beanpot history and second when opposing Boston College. 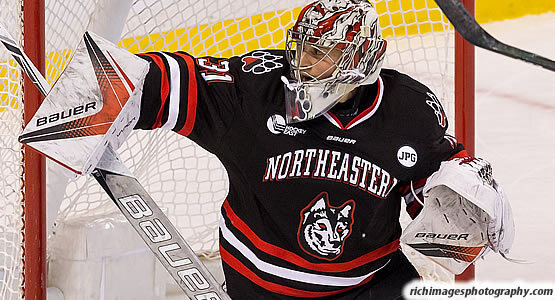 Primeau's 37 saves are the most by a Northeastern goaltender in a shutout performance since Chris Rawlings' 41 saves during the 2011 semifinal round against Harvard. Northeastern will seek its first Beanpot championship since 1988 on Monday, Feb. 12, at TD Garden against the winner of the tournament's second semifinal between Boston University and Harvard. Puck drop of the championship game is scheduled for 7:30 p.m.